Join us in celebrating the amazing difference HopeMatch made in the lives of the families we served in the 2014 Christmas season. Here are some thank you letters we have received that convey why we help the people who often fall through the cracks and feel forgotten...that is until HopeMatch arrives on the scene! Christmas is typically a stressful time of year with shopping, hoping to find the "right" gifts, and finding a way to pull it all together in time for Christmas morning. This year however was different than in years past. Being unemployed made the Chirstmas holidays a bit more stressful than usual and both my husband and I knew that the gifts under the tree would be sparse this year. We had managed to put together a little bit of money, but with 4 children, 3 of which still absolutely positively believe in Santa, we were a bit afraid we might not pull it off. That was until we go the phone call from HopeMatch. What a difference that one phone call made for us this holiday season. 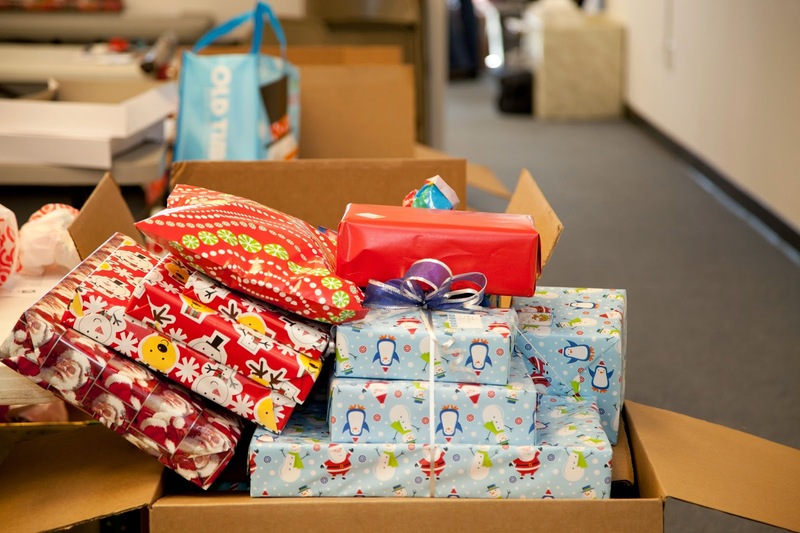 When HopeMatch volunteers delivered the boxes full of wrapped gifts it was hard not to feel a bit uneasy. My family has never received assistance of any kind before, and it was hard to put our egos aside and just accept the fact that everyone deserves a break once in awhile. It was especially hard on my husband, since for him it meant that somehow he wasn't doing his "job" as provider for his family. However, the volunteers were so kind and made us both feel at ease. Bringing the boxes into the house later that evening, and putting the presents under the tree, was amazing. It was like being a kid all over again with the excitement of Christmas. Even as an adult you couldn't help but sit and wonder what could possibly be inside all the beautifully wrapped gifts. Christmas morning finally came and the children were up early as usual. They simply couldn't wait to unwrap the gifts any longer. My husband and I sat down with slight trepidation since we also had no idea what they might find under the tree. With Liam we were a bit more skeptical. This year he as been a bit harder to please. We quickly found out there was no need to worry. He also found an airhog helicopter under the tree. He slowed his progress since he had to open it and try it out immediately! We found him slowing down and taking time to appreciate each item he opened, taking time to really check it out, take it out of its packaging and wanting to play a bit in between opening gifts. Zachary was the one child we worried about the least. Being the oldest meant he knew more about the current situation than the younger children in the house. He was aware of the phone call from HopeMatch and realized how much it meant to everyone to get help this Christmas. He loved all of his gifts and for him it really meant something. 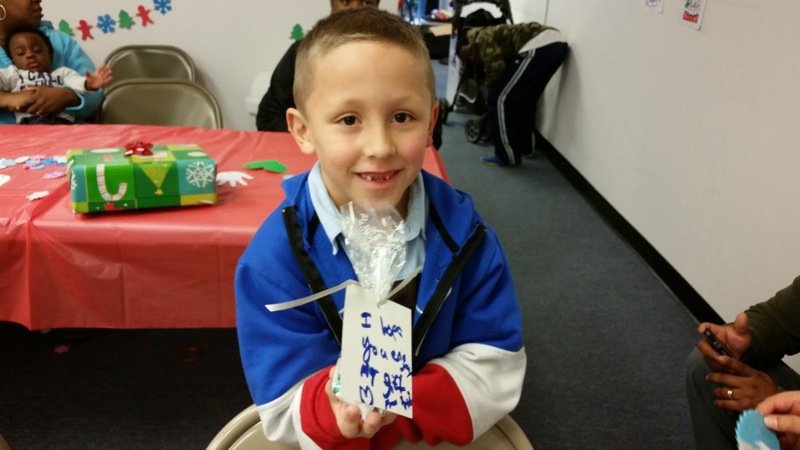 It touched him to know that someone, a perfect stranger, had made Christmas happen for him. As far as Alan, I think this year hit him the most. Getting a watch, which he now wears daily, was huge. His broke months ago and it's made him nuts not knowing the time. Also, he really needed new tennnis shoes, although he'd never admit it to anyone. It was hard not to notice the sole peeling off and the hole that was now in its place. Findng the new shoes under the tree brought him to a standstill. It was obvious he was touched. For me, clothes! I honestly can't recall the last time I bought myself anything new. With three growing boys, my getting new clothes is always at the bottom of the "to-do" list...The gift cards were also a wonderful surprise, and made both my husband and myself a bit teary eyed. Although watching the office close in August, and seeing my husband lose his job was hard, watching Christmas approach and not being able to find work was worse. Wondering how you are going to pull things off, scared that you might ruin what every child thinks of as "the best holiday of the year" is terrifying. HopeMatch is a glittering beacon of hope for families like mine - knowing that there are people out there who are willing to help you, perfect strangers, is simply incredible. I can't begin to express how much being a part of HopeMatch has meant to us. Until this year I had no idea that an organization like HopeMatch existed, but I am sure glad that they do. So thank you to everyone who brought smiles and joy to the faces of my family this year. We appreciate you so very much! Thank you so much for extending your kindness and resources to our little family this Christmas. 2013 and 2014 were very difficult years for us. We were blessed to grow our family by one miraculous micro-preemie, but have endured much pain and heartache in receiving difficult diagnoses for our little man. Your gifts were practical and so welcome! Hundreds of people prayed for us and reached out to us during our son's NICU stay. But, honestly, it has been much harder and much more lonely since we have brought him home. We were not prepared for the difficulty of caring for a medically fragile child. Gifts of diapers and wipes and diaper bags may seem so basic, but to us, they were the equivalent of gold! You will never know how you blessed us during this lean time. Our hope is to continue to bless others, espeically those who "have, but don't have enough." I would just like to say how much I appreciate your thoughtfulness. I looked like a little girl, as I opened all my gifts. I must say that my angel sure did know me. And everything was perfect. Thank you again. It really meant so, so very much to me. I love the Lord I praise Him every day. I'm so blessed. May you and your family also be blessed each day. Again, thank you so much. From the bottom of our hearts we are so thankful for what you all have done for us. We could not believe when we got the phone call, or when the gifts arrived. Just unbelievable!!! We CANNOT begin to thank you all enough. Everything was so perfect, and our Bibles are so great. We all got to use them today at church, and they each come with daily devotionals which we will be doing as a family. This organization and people involved have the biggest hearts ever. My childrens Christmas was amazing thanks to you. Thanks so much for everything!! What Do HopeMatch and Taylor Swift Have in Common? There's been a lot of buzz this holiday season about how Taylor Swift personally gave Christmas presents away to her fans. We saw the video she created to show how she made it happen, and couldn't believe how her approach was so similar to how HopeMatch makes a difference in families' lives in our community. Watch the video and then read on and see how much we have in common with Taylor Swift. 1. WE BOTH PERSONALIZE: Taylor Swift searched her fans social media to find out specific things they like, then bought them those things. She wanted to make sure what they received was special. At HopeMatch, we also go the extra mile to find out what our families need and want so that they can have a special, magical Christmas, and it makes all the difference. One of our families wrote to us after Christmas and said, "The presents were absolutely amazing. It's like you knew my family personally and each gift was thought about. I personally haven't received a Christmas gift since I was 13. To open the gifts along with my children was such a joyful experience." 2. WE WRAP THE GIFTS FOR THE SURPRISE ELEMENT: Taylor Swift personally wrapped the gifts she bought and boxed them up. At HopeMatch, we have special wrapping volunteers who make sure all the gifts are packaged and wrapped and ready to go under the tree. We do this so that the parents can be excited too, not knowing what they are getting! One of our families wrote this to us recently, "When the van came and the two young men came with the delivery, I felt like a big kid not knowing what the packages contained and extremely thankful." Another parent wrote, "Not only was Christmas exciting for my children, but on Christmas Eve I could barely sleep I was so excited about our Christmas. My excitement was escalated by the fact that we were all opening complete surprises." 3. WE INCLUDE A PERSONALIZED CARD: Taylor Swift wrote a long card to each of the fans she surprised with a box of Christmas presents. We imagine she thanked them for being them and told them how great they are. At HopeMatch, we have special Scribe volunteers that write personalized cards to each family speaking LIFE and HOPE into their situations. Many times, the families say these cards mean just as much, if not more to them than the gifts. One family wrote us and said, "Gratitude...that is the only word that comes to mind. We are so incredibly thankful for you and what you provided for our family for Christmas. More importantly what you said in the card...those are the words we cling to during this difficult season!" 4. "WE GIVE A CRAP": I think we can sum up what Taylor Swift and HopeMatch do with this one statement: We give a crap. This is a quote that one of our families said about us and I believe the same can be said about Taylor Swift. She doesn't have to stay in touch with her fans on a personal level. She didn't have to buy presents herself, wrap them herself and mail them herself. I'm sure she employs many people who could do that for her. But she did...and it meant a lot to her fans. 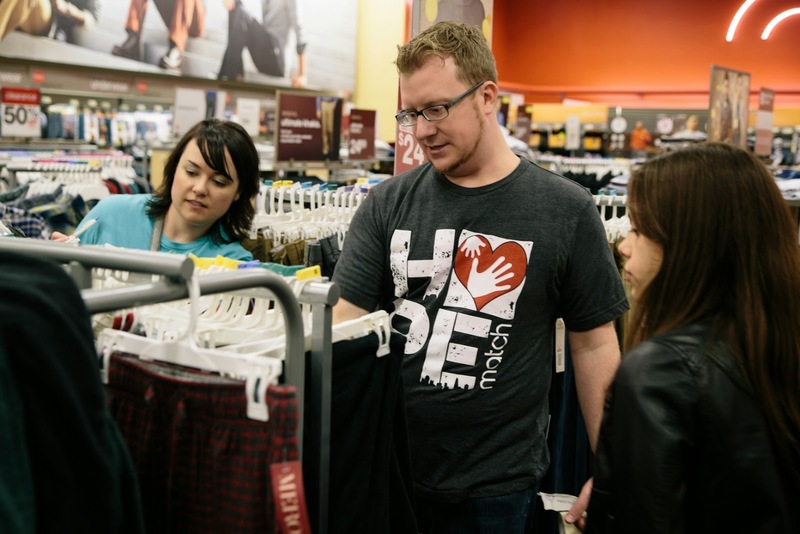 At HopeMatch, I'm not sure if we can call our supporters and volunteers "fans," but they are people who could spend their time and money many ways, and they choose to serve and give through HopeMatch. We believe it is because they care. We could serve the poorest of the poor families, however we choose to make "fans" out of the overlooked and forgotten; the ones that won't ask for help for themselves because someone else is always in worse need than them. Those are our fans and we are humbled to served them. We received a card from a recent widow we served this past season and she summed up what means the most to her, "It's more than the gifts wrapped in paper; it's the gift of the spirit that changed my season and touched my heart." Thank you to everyone who gave of their time, resources, and prayers this past season. We are so grateful for you, and so are our "fans." You can expect to hear about much more from HopeMatch this year as we serve the families we helped this past Christmas. We are excited about giving them a Hand Up, and not just a hand out. We are excited about helping to restore dignity and respect to their homes. We are committed to encouraging them to continuing fighting and hoping... and in return, we will most definitely become THEIR fans.